My 2002 Road King and I are best friends and riding is my first love. Although, I love my husband with all my heart, there is a feeling I get when riding my Road King that I can not get from any relationship. My Road King talks to me, from the roar of the engine to sound of the pipes. She is a reflection of me and who I have become, ever since we meet and took our first ride together, it was love at first sight. I saw her on ebay and knew I had to have her. It took over a month for her to show up at my doorstep, and she was well worth the wait. I was anxious to take her for a ride, but my husband wanted to be sure that she would not give me any problems, so he rode her for the first time. And all he had say about her was, "Be careful, she is full of power and has a lot of get up and go." My husband and I leathered up and the four of us, his 09 Road King and him, my 02 Road King and I, and went for our first ride together. I told my husband that I was a little nervous, as I was stepping up from a Dyna Superglide to the Road King and was not sure of the weight nor the cornering capabilities of the RK. Well, all I can say is, there was not one problem, she cornered perfectly, I felt at times all I had to do was think about turning and she would do it. As for the weight difference, that was not a problem, I raise off the kick stand with my thighs more than my arms and up she goes, no effort. It is as if she, is itching to go and helps me get her ready for the ride. She had 4000 miles on the odometer when I got her in April of 2009, by the end of the year, she had over 14,000. We went to Ogden UT, Albuquerque NM, Lincoln NE, and all over the mountains in Colorado that first year. 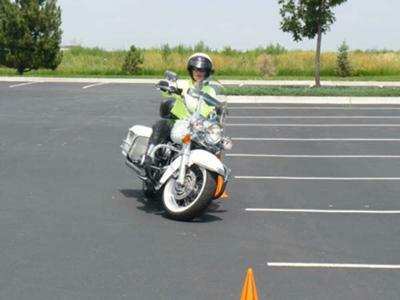 My husband and I are precision riders and put on demonstrations of slow ride maneuvers, like the ones motorcycle police officers use, and we are civilian's. She loves the tight turns and the quick movements I put her through. She does not miss a beat, she is my companion, my friend. She brings me comfort at the end of a hard week, she massages the aches and pains of everyday life, she carries my burdens and helps me leave them along the highway or byway. She hums me a tune when ever we are together. It has been a cold and snowy winter here in Colorado, so she has not been able to come out and play much. She seems depressed and sad. To ease her through this time, I sit in the garage with her every day, with my morning coffee. That may sound strange to you, but she is my best friend and I miss her right now. And we don?t smoke in our home, so I have go to the garage for a cigarette. She is the ROAD QUEEN, my BEST FRIEND. I love your story, and I can totally relate. Riding is like therapy for me. When I get on my bike, it's just my bike, me and the road. All my worries are left behind. I understand completely and feel the same about my motorcycle. It was the same feeling I had when I rode my horse. Just the two of us. I feel the best when I'm riding, even in bad weather. I just love being with my motorcycle and am fortunate to be able to ride year round. My friends always preface an invitation with "if you aren't riding".